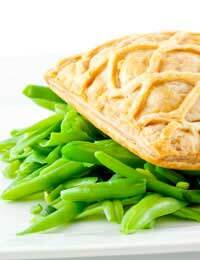 Salmon in pastry: a luxury dish without the effort and mess normally associated with such gourmet food, but with all the flair! They will think you’ve gone to so much trouble to produce this little wonder...Keep it to yourself. This meal makes a really nice change, looks and tastes wonderful, yet it’s simple and takes a short amount of time to prepare. This ‘salmon in a blanket’ recipe is a lazy version of a Russian fish pie dish called ‘kulibyaka’. Prepare the rice by washing it thoroughly in a sieve under a cold tap. Cook as directed (about 12 minutes in boiling water) then, drain and rinse again to stop the rice grains from sticking together. Drain the can of salmon and discard any bones and skin. Mix together in a large bowl the salmon, rice and chopped eggs; not too enthusiastically or the mixture will go mushy. The finished dish looks better if the salmon and egg are not broken up too much during mixing. Melt the butter and then add this to the salmon mixture. Chop the herbs and add them to the bowl along with the tomato puree or ketchup. Season the mixture with a little shake of sea salt and freshly ground black pepper-or use cayenne pepper if you prefer a little more bite. Roll out the prepared pastry to about 35 x 25cm or to fit the baking sheet you plan to use. Use a wet piece of absorbent kitchen paper to dampen the baking sheet, then, place the rolled pastry onto the baking sheet. Carefully spread the salmon mixture along the centre of the pastry-from top to bottom. Make sure it is evenly spread. Use a pastry brush to dampen the side edges of the pastry and then, bring them together along the middle of the salmon mixture. Use your finger and thumb to ‘pinch’ the two edges together. With a sharp knife, make a few cuts (3 or 4) on either side of the middle ‘pinched’ pastry-keep it looking symmetrical.Finally, brush the pastry all over with your beaten egg. Bake in the preheated oven for about 35-40 minutes. To create a quick and easy citrus salad, simply use one 125g bag of mixed salad leaves, then, add the drained contents of a small can of citrus fruit segments. Alternatively, slice and de-pith two oranges and one grapefruit and add two tablespoons of lemon juice, one tablespoon of clear honey and one tablespoon warm water to make a tangy dressing.Garnish with some chopped nuts if you fancy.